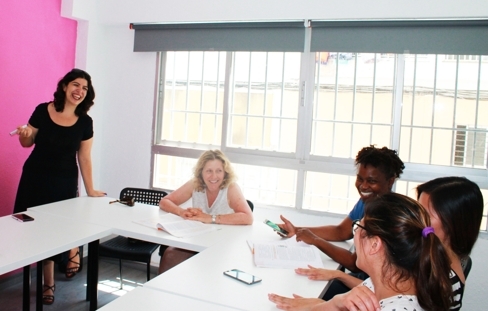 AIL Malaga offers high-quality Spanish courses both near to the sea and the city centre. The Spanish school is in an ideal location, a mere 10 minute walk from the beach and 15 minutes by bus to the centre. This allows the students to enjoy Malaga to the fullest by cooling down at the beach, doing outdoor activities and visiting historical monuments found in the city centre. With a reduced group size, an average of 4 students per class and a maximum of 8, we are one of the schools in Malaga with the least amount of students per class. This makes it easier for the teacher to pay attention to each student and to do a close follow-up of your progress. Our Spanish courses cover all types of needs our students might have. We have varied linguistic objectives: learning Spanish for university, improving your professional career or simply discovering a new culture. The variety of the courses we offer make our school lively and dynamic. The Spanish classes are very fun, they make for a positive and friendly atmosphere which really help the learning process and boost students confidence when speaking Spanish. Moreover, we offer Spanish classes for all levels from A1 (beginners) to C2 (proficiency) meaning there is always an appropriate group for your level. Our Spanish courses are combined with fun activities which are carried out in the afternoons. The activities the school offers have been designed for you to have lots of fun and have the opportunity to meet many people. They include visits through the city and social and sporting activities which will help you make friends for life. The student accommodation choices we offer are of the utmost quality. This is because we closely monitor the experience of our students. Our host families are visited regularly and the flats are checked before every stay. 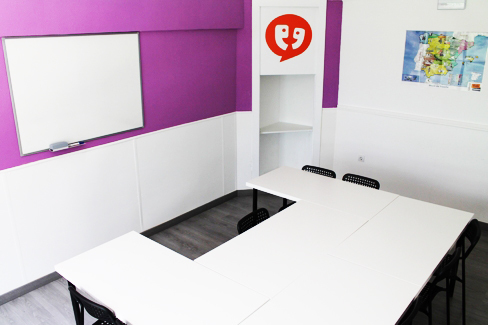 This way we know you are being offered the best conditions to learn Spanish and have a good time. Our teaching methods are innovative, interactive and communicative, this allows the students to gain an enriching and unforgettable linguistic experience in our school. Our effective methods encourage communication so that the students are able to think and express themselves in Spanish with more fluency. Our Spanish teachers are the best ones you can find: experienced, motivated and dedicated to teaching Spanish, they will help you progress quickly making your linguistic journey an enjoyable one. Being experts at teaching Spanish, we are well-known for teaching students to pass the DELE exam, the official Spanish diploma that is internationally recognised. More than 90% of our students in AIL Malaga who prepare for the course manage to obtain the diploma. An unforgettable experience: Our students reserve a place with us because their friends have recommended the school. This is because, from the very first day till your last here at AIL Malaga, all the members of our school will help you with a big smile on their faces, making your experience in AIL Malaga the best it can be.